Cleveland Browns head coach Hue Jackson has confirmed that DeShone Kizer will start at quarterback in week 1 of the regular season against the Pittsburgh Steelers. Kizer was locked in a training camp battle with second-year quarterback Cody Kessler and the acquired veteran Brock Osweiler, but has earned the starting job through his performance this preseason. Through two full weeks of the preseason, Kizer has the edge over both quarterbacks in PFF overall grade, with Kizer’s grade of 72.4 bettering both the grades of Kessler (65.9) and Osweiler (49.9). 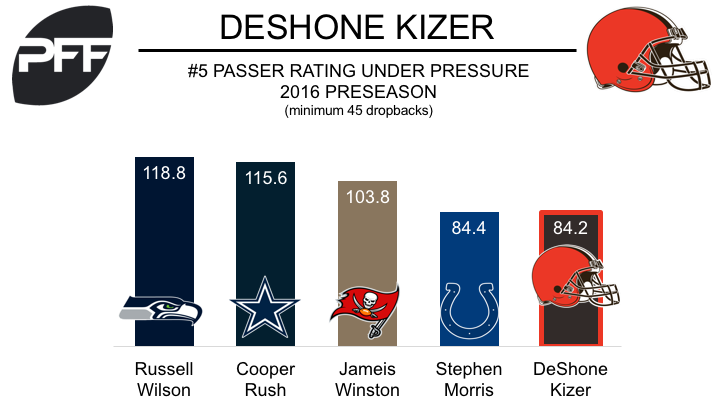 Kizer has also outperformed the group when throwing the ball deep. Through three preseason games, Kizer has posted a passer rating of 114.8 on throws of 20+ yards, topping both Kessler’s mark of 95.8 and Osweiler’s mark of 39.6. Through three preseason games, KIzer has been effective while under pressure, which is a positive sign for any rookie quarterback. Kizer’s passer rating of 84.2 on throws under pressure ranks fifth among the league’s quarterbacks, and once again betters the ratings of both Kessler (71.9) and Osweiler (39.6).